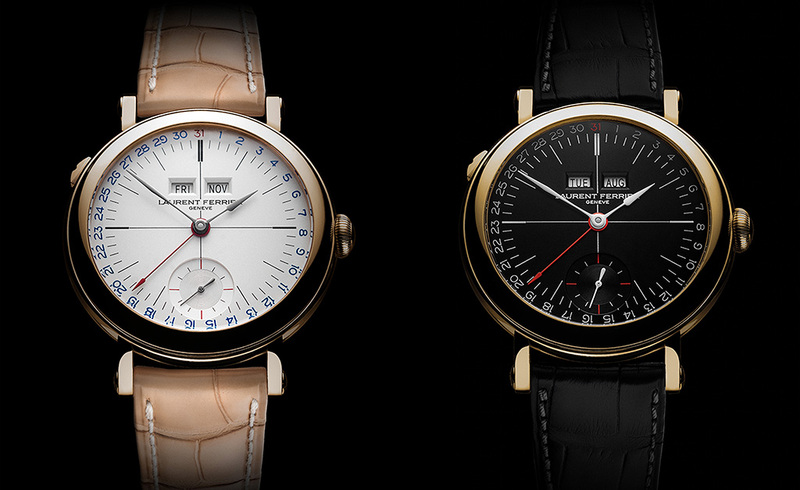 Laurent is possibly first out of the gates this year with their pre-SIHH release. Two watches form this new release. Both very handsome watches, which we look forward to photographing and doing hands-on in SIHH. The new release is the Galet Annual Calendar School Piece Opaline Black & White. 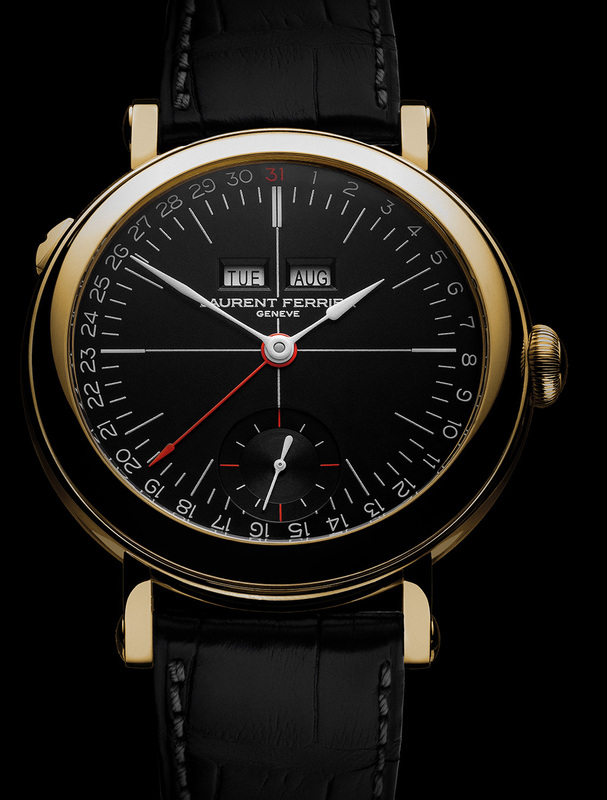 The annual calendar is not to Laurent Ferrier. Not standalone or in combination to their school watch (French: Montre Ecole). 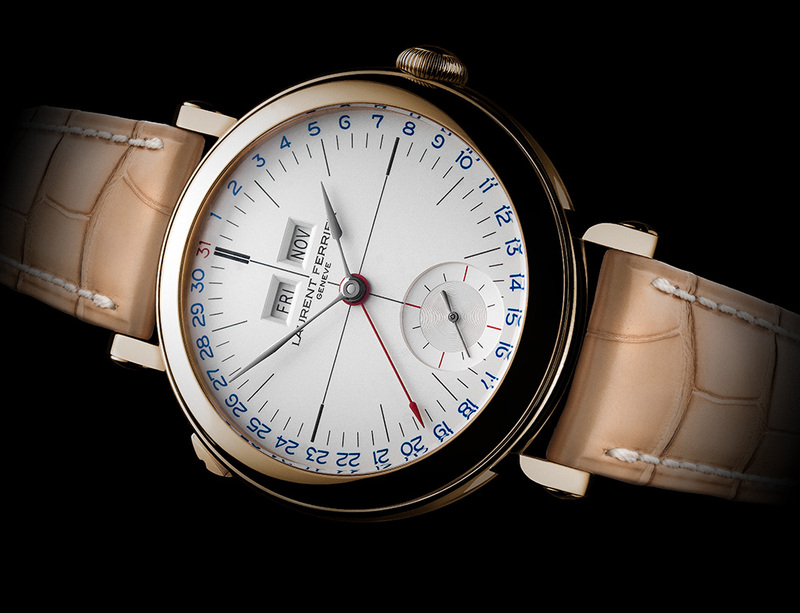 The Galet Annual Calendar Montre Ecole Caliber no 126.01 won the award of GPHG in the Men’s Complication category. 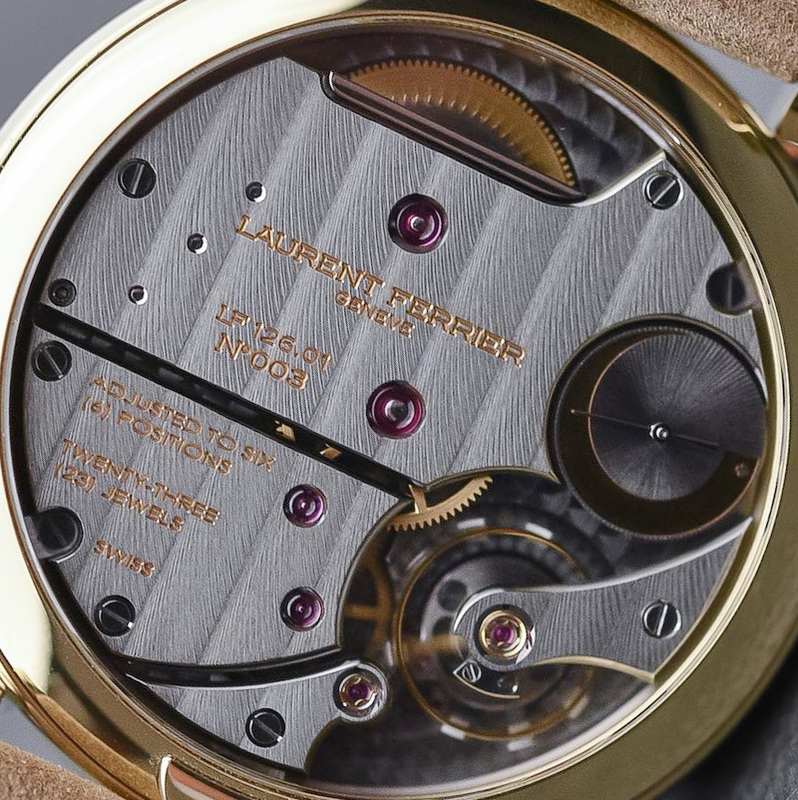 This distinction gave Laurent Ferrier the opportunity to offer a new line to this award-winner caliber. The Galet Annual Calendar School Piece Opaline Black & White is designed in-house. These timepieces was developed with the aim of ensuring extremely smooth handling, while also ensuring visual balance, readability and performance in all circumstances – all values dear to Laurent Ferrier. With its date and month fast-adjustment by simply turning the crown forward and backward, these timepieces offers a great experience to the wearer. 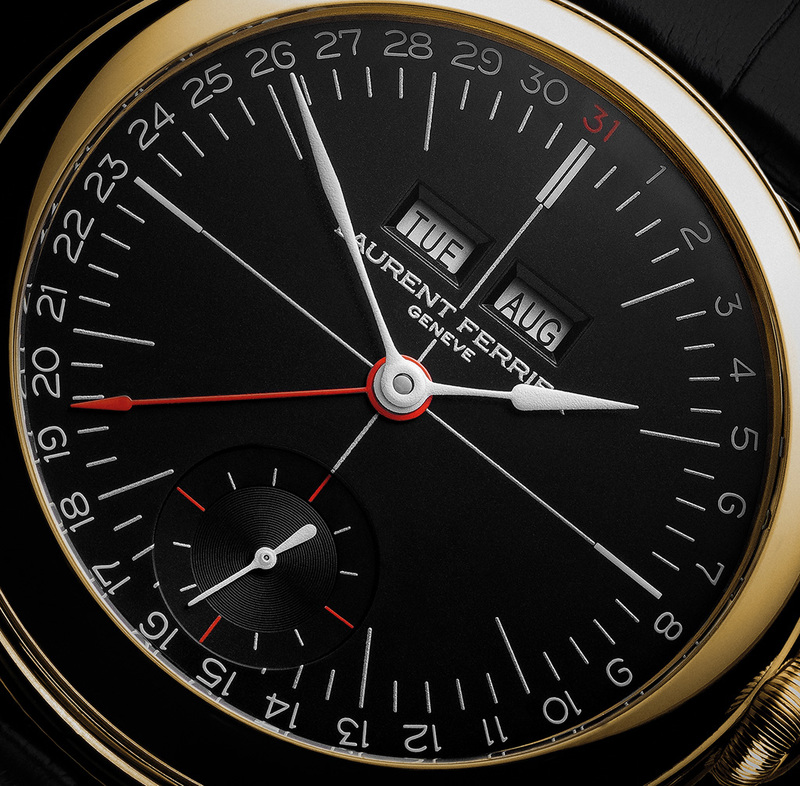 The LF126.01, handwound movement featuring an annual calendar. Seen here in the back of the earlier pale yellow version. The date is clearly indicated by a central hand and the days of the week and the months in two beveled apertures. This display combines reading comfort and balanced beauty. The user-friendliness was at the heart of the caliber design. Indeed all the adjustments are extremely easy to make. The days of the week are updated by simply pushing the “easy to grip” button delicately integrated on the left side of the case. All the other adjustments are made by pulling and turning the crown. No tool is required. The fast-adjustment of the date with the central hand can be made by turning the crown forward and backward, allowing the month to be automatically updated accordingly. The sapphire crystal case-back of the Galet Annual Calendar School Piece Opaline Black & White provides a fine view of the finesse of the finishing. In addition to the Côtes de Genève motif with a ruthenium treatment adorning the bridges and the circular-graining of the mainplate, the sides and interior angles are manually chamfered and the screw heads are polished. We chose to use a long “blade” type click ratchet, polished and with a curved shape that reminds the Galet Classic Tourbillon Double hairspring. The sub-dial at 6 o’clock has a circular satin brushed outer circle and a snailed finish in the center. A sunburst finish was chosen to decorate the power-reserve area indication. Movement: • Manual winding calibre LF126.01. • Swiss lever escapement. • Balance Screw. • Indications: Hours and Minutes in the centre. Small seconds at 6 o´clock. Power reserve area indicator on the back side. Annual calendar: – Calendar central hand. – Day-disc and Month-disc (Automatic correction for months with 30 or 31 days. One manual correction on March 1st) • Semi-instantaneous calendar. Days and month semi-instantaneous apertures. • Correctors: Crown for winding, time-setting, calendar central hand and months. Push button at 10 O´clock for days of the week. • Correction forward / backward of the calendar on intermediate position of the crown. • Movement diameter: 31.60 mm (14´´´). • Thickness: 5.80 mm. • Frequency: 3Hz (21´600 /H). • Power reserve: 80 hours. • Number of components: 235. • Number of jewels: 23. Case: • 18K / 750 5N red gold, 18K / 750 yellow gold or stainless steel • Size: 40 mm diameter. • Thickness: 10.10 mm or 12.80 mm including the sapphire crystal. • Domed sapphire crystals, front and back. • Water resistant to 30 meters. • “Ball-shaped” crown in stainless steel. • Vintage-inspired numerals, 1-30 painted in light blue and 31 in red for the black dials or dark blue and burgundy for white dials. • Small second at 6 O´clock, with circular satin brushed outer circle and snailed finish in the center. • Bevelled day and month apertures. Hands: • 18K / 750 210Pd white gold. • Hours and minutes: “Assegai-shaped”. Painted in white for the black dials or ruthenium treated for the white dials. • Seconds: baton-type with counterweight. Painted in white for the black dials or ruthenium treated for the white dials. • Date: Painted in red for the black dials and burgundy for the white dials. Leather: • Honey alligator leather Alcantara lining for white dials or matt grey Alligator leather with Alcantara lining for black dials. • Pin buckle or a double blade folding clasp.